We all love gathering with family and friends for the holidays. But at a busy time of year, preparing a meal for guests can go quickly from a dreamy holiday scene to a kitchen nightmare! The “I Love My Instant Pot®” Free Holiday Menu takes the stress out of holiday entertaining with a full menu of easy-to-prepare holiday classics. With these simple recipes, from appetizers to desserts, you easily can serve a delicious meal made with love, including sweet and savory dishes like Savory Acorn Squash Soup and Spiced Red Wine-Poached Pears. 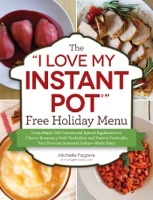 Gather round the table and enjoy The “I Love My Instant Pot®” Free Holiday Menu!